The latest brand to draw inspiration from the Silk Road is Piaget, the Swiss luxury brand of watches and jewellery. 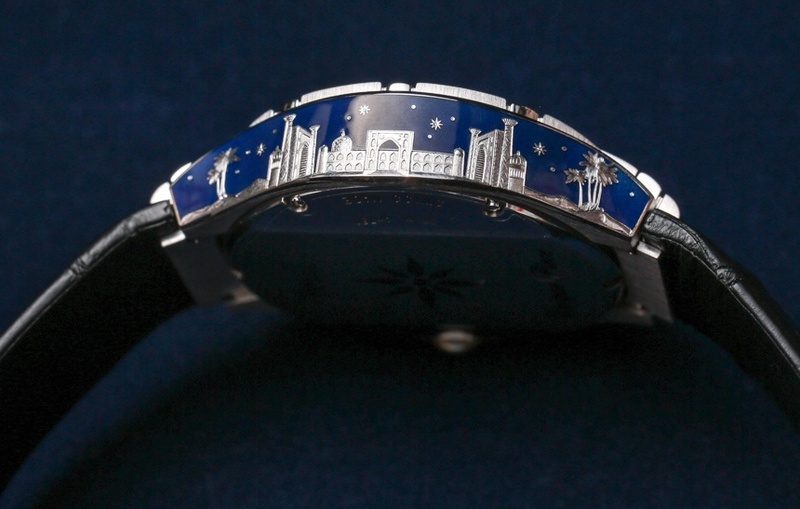 The "Secrets and Lights" collection highlights two of the most important Silk Road cities - Samarkand and Venice. 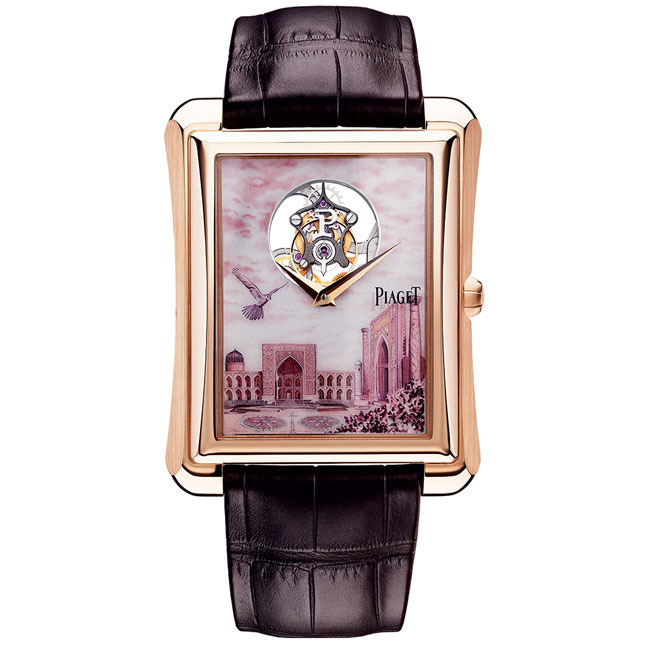 The Samarkand watches include enamel faces inspired by the mosaic tiles of Samarkand's monuments, the Registan ensemble and caravanserais along the Silk Road. Watchmakers adopted enamelling from the 15th century. However, during the 20th century it was rarely practised. Piaget decided to revive the prestige of enamelling and now continues this tradition of miniature painting (still widely practised in Uzbekistan) thanks to a traditional technique. The enameller begins by crushing and cleaning raw enamels to obtain a very fine powder, which is then mixed with essential oils to achieve the colour palette. The enamel is applied with a brush in successive fine layers, each of which is oven-fired at temperatures exceeding 800 °C. Each enamelled piece requires nearly twenty firings in the oven. The enamel and its colours are then set forever. 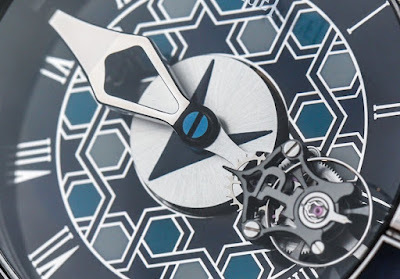 The Secrets and Lights collection is a collaboration of Piaget’s Haute Joaillerie and Haute Horlogerie departments - as well as the 38 watch designs, there are 93 luscious jewellery pieces. Sapphires from Sri Lanka, rubies from Mozambique and emeralds from Columbia all come together to evoke the splendour of the mosaics that adorn Samarkand's monuments. 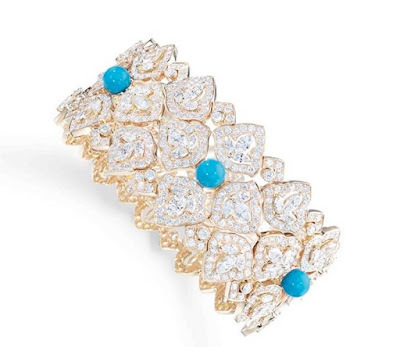 The pieces include a long necklace with cascading turquoise beads contrasted by emerald-heart flowers and a scattering of diamonds throughout. A four-leaf flower-ring is centered with a cushion-cut emerald (7.29 cts), 12 marquise-cut diamonds (1.20 cts), four turquoise beads (approx. 0.50 ct) and 130 brilliant-cut diamonds (3.12 cts). 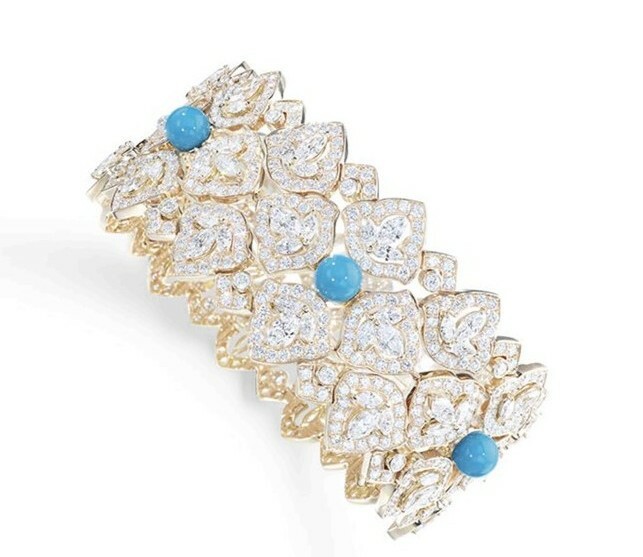 A flower-shaped 18 carat pink gold bracelet follows the eastern arabesque pattern and is decorated with marquise-cut diamonds, turquoise beads and brilliant-cut diamonds. You can see more of Piaget's Secrets and Light collection by scrolling down its website and swooning. To read about other designers who have been inspired by Central Asian patterns and history, click on the related links below.